The singer and guitarist revealed a pic of what looks to be a custom overdrive stompbox. 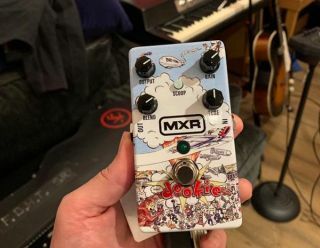 No other information has been released yet, but the pedal, which sports Output, Gain, Blend and Tone knobs, as well as a Scoop button, is believed to be an overdrive pedal based on Armstrong’s Dookie tone, which powered hits like “Longview,” “Basket Case” and “When I Come Around,” and was derived from a modded Marshall Plexi 1959SLP reissue that Armstrong nicknamed Pete. To check for updates, head over to JimDunlop.com.